Fall is my favorite time of year. In addition to cooler weather, the excitement of the approaching holidays crackles in the air. Spring colors enchant me; Fall creates electricity which enlivens my imagination. 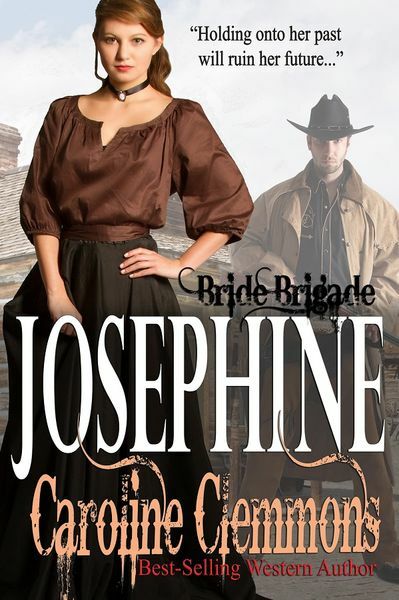 My latest flight of imagination is a new western historical romance series called BRIDE BRIGADE, and JOSEPHINE is the first release. Eventually there will be seven books in this series. Names of the diverse heroines to follow are Angeline, Ophelia, Cassandra, Lorraine, Rachel, and Prudence. Due to fitting these around other scheduled projects, Bride Brigade books will be spaced out over the next six or seven months. I hope you’ll read each one. I have to admit I love the name of my fictional town, Tarnation, located in the Palo Pinto Mountains of North Central Texas just north of present-day Interstate 20. Every state has numerous unusual town names. This one makes me smile every time I use the word but I know why the town is called by that name. You have to read JOSEPHINE to find out. Josephine Nailor is desperate to escape a terrible situation. When the opportunity arises via a newspaper ad, she and her best friend slip away from their oppressive fathers and head for Richmond. Neither can relax until they’re far away from their tiny hometown. With wealthy young widow Lydia Harrison’s help, Josephine and six other young women have a new life waiting in Tarnation, Texas. Michael Buchanan is fairly content running his mercantile and being mayor of Tarnation. The town is dusty and tiny, but it’s growing. He believes it holds all he needs to be happy—except a wife. There are no available women in town, but he hopes Lydia Harrison’s Bride Brigade will offer a woman he can wed. He is immediately attracted to Josephine. But Josephine has every reason to mistrust men in general and politicians in particular. Will her misgivings ruin her chance at happiness? Josephine stepped from the stage and stared at the men assembled. Every muscle and bone in her body ached from the long ride from Fort Worth. A breeze swirled dust from the street without cooling her skin. She thought she’d been prepared for a small western town, but Tarnation shocked her. There were only a few stores. Surrounded by low hills she learned were called the Palo Pinto Mountains, the town must not have over two hundred residents. One of the tallest and most handsome men she’d ever seen stepped forward and removed his western hat to display thick dark hair. His electrifying blue gaze locked with hers until she pretended to check her purse. Inwardly, Josephine cringed. Barely off the stage and already she encountered the mayor and the sheriff. While they were both nice looking and neither leered, she certainly wouldn’t trust either man. She’d hoped to reach a safe haven where no one knew her and she’d be free of her father and crooked politicians. Josephine had no intention of being at the mercy of any man ever again. She’d look for some means to earn her own way. Glancing around the businesses, she realized her choices were severely limited. In an instant, the trunks and cases that weighed down the stage were unloaded and hefted. Lydia led the girls, many of whom chattered excitedly. Following behind, men joked and talked while they carried the women’s belongings. Lydia turned in at a neat gray clapboard home trimmed with white and wine. A painted picket fence surrounded the front yard. The house was huge, by far the largest in sight. Josephine believed this home would have been elegant in Virginia before the War. In this dusty Texas town, the effect was astonishing. Nook http://www.barnesandnoble.com/w/josephine-caroline-clemmons/1122676778;jsessionid=93795F25673A572EB3B4D1AC1378BDCA.prodny_store01-va10?ean=2940152308112 in print or e-book. Caroline and her husband live in the heart of Texas cowboy country with their menagerie of rescued pets. When she’s not indulging her passion for writing, Caroline enjoys family, reading, travel, antiquing, genealogy, painting, and getting together with friends. Find her on her blog, website, Facebook, Twitter, Goodreads, Google+, and Pinterest. Subscribe to her newsletter here to receive a FREE novella. Thanks to Delilah for sharing her blog with me today.